Shoulder to shoulder, backs to the door, eight sheep say "baa!" to chilly drafts. 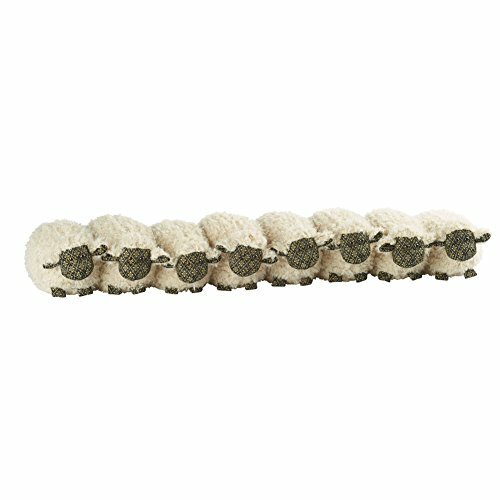 Fluffy faux wool with black brocade faces, ears, and feet, all are weighted with quartz sand. Between breezy seasons, you might display the flock on a bench or fireplace hearth. About 8" high, 32" long. Not a toy. SHEEP THAT SAVE YOU MONEY - Have a little humor with your energy efficiency. Loyal flock of sheep blocks cold or hot air from entering below your door to significantly reduce your gas and electric bills. HEAVY AND DURABLE - Weighted with quartz sand, these sheep great at providing insulation and staying in place. FITS STANDARD DOORS AND WINDOWS - Versatile stopper measures 32" in length, so it fits within most standard doors and window sills. USEFUL IN ALL SEASONS - Equally effective at blocking cold air from escaping in the summer as it is from stopping cold breezed in the winter. A GREAT GIFT - Charming and functional, get it for anyone who loves unique home decor and saving money. If you have any questions about this product by Dora Designs, contact us by completing and submitting the form below. If you are looking for a specif part number, please include it with your message.